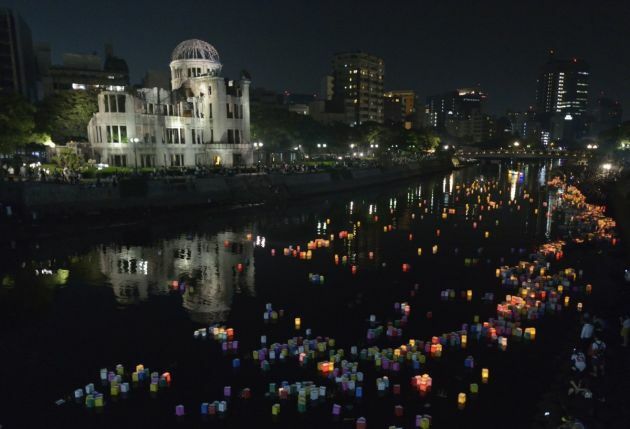 (Photo: © Paul Jeffrey / WCC)Floating candle lanterns fill a river on August 6, 2015, in Hiroshima, Japan, in front of the city's atomic bomb dome. The lanterns, thousands of which were launched on the 70th anniversary of the atomic bombing of the city, bear handmade messages and drawings, conveying each person's prayers for peace and comfort for the victims of the violence. A United Nations group with strong support from churches and ecumenical groups is urging States to "negotiate a legally-binding instrument to prohibit nuclear weapons." Do it "in 2017" and make sure the negotiations are "open to all States" and include civil society, Jonathan Frerichs reports for the World Council of Churches. The demands are in a report adopted last week by a United Nations working group of more than 100 countries meeting in Geneva. The report with this recommendation was adopted by a three-to-one margin with broad inter-regional support despite a boycott by the nuclear powers and strong resistance from their allies. The working group's final report, adopted on Aug. 19, will go to the U.N. General Assembly this October. A majority-led resolution to start negotiating a nuclear weapon ban treaty is now likely to emerge there. "This development marks the highest point so far in a growing wave of support for outlawing nuclear weapons on humanitarian grounds," said Peter Prove, international affairs director of the World Council of Churches. "Faith-based advocacy has contributed to this effort, and will be greatly needed to help bring the will of the majority, the rule of law, and the welfare of all people and of the whole creation to bear on nuclear-armed countries which are modernizing their arsenals instead of eliminating them." During the working group, networks of the WCC and Pax Christi International contacted 24 governments to advocate for a ban. They worked as part of the International Campaign to Abolish Nuclear Weapons to stress the need to start negotiations in 2017 and for such negotiations to be open to all states, block-able by none and to include civil society. The final draft produced by the UN working group had been carefully revised in order to achieve consensus and be adopted without a vote. But at the last minute Australia hardened its position and called for a vote. Ultimately 68 States voted to adopt the report, 21 nations joined Australia in voting against adoption and 13 countries abstained. Ecumenical advocates are in contact with governments on all sides of the issue, the WCC reported. Advocates in Brazil, Mexico, Nicaragua, Nigeria, Egypt, Sweden, Finland, Ireland, Switzerland and New Zealand encouraged their governments, part of the nuclear-free majority, to press for a nuclear weapons ban. Most of their governments were among the 68 nations in favor of the final report with its ban recommendation. Churches and related organizations also engaged with governments that rely on nuclear weapons, which are mostly NATO members. The bishop of the Evangelical Church in the German state of Baden called government attention to the renewed importance being given to nuclear arms, the long-term modernization of nuclear arsenals, and the "catastrophic consequences" which nuclear weapons cause. The church asked the government to help strengthen legal norms against nuclear weapons. A ban on nuclear weapons would be similar to the existing prohibitions against chemical and biological weapons of mass destruction, the church noted. Church and Peace, a Pax Christi member in Europe, contacted the governments of Germany, Switzerland and two nuclear powers, France and the United Kingdom. The Canadian Council of Churches wrote Canada's foreign minister that "when measures employed to defend nation states...threaten humanity and the planet itself, such measures must be categorically rejected." Members of the WCC Ecumenical Peace Advocacy Network and Pax Christi International have also been in contact with the Australian, Netherlands, Belgian and Norwegian governments. These states, which rely on US nuclear weapons, were urged to engage in the ban debate in good faith. Contacts in national capitals were followed up by ecumenical delegates in Geneva. Support for establishing a new legal prohibition against nuclear weapons is stronger than the 68 States that voted "yes" at the U.N. working group. Earlier in the group's final week, 108 states of Africa, Latin America, South East Asia, the Pacific and a few in Europe called for a time-bound commitment to start negotiations on a ban. One hundred twenty seven nations have signed a "Humanitarian Pledge" to make new treaty law against nuclear weapons, while 159 states have made a joint declaration that nuclear weapons "must never be used again, under any circumstances." One hundred thirty five States voted at last year's UN General Assembly to set up the current Open-Ended Working Group to identify "concrete, effective legal measures" required for a world without nuclear weapons. A large majority of the group has now concluded that outlawing nuclear weapons is the place to start.